Tis the Season to be Thankful for Making a Resolution to Take a Leap! What percentage of Americans love pandas? What percentage of Americans live to be 93? That doesn’t even make sense. Last try. Musical theater??? What percentage of Americans love music? Okay. Well, we’re a little closer now … but I think I’ve actually made my point better than any statistic could have. It’s a football world we live in and I’m the only fool clutching a game program waiting for them to flash the stadium lights to let me know the second act (cough, sputter) I mean half is about to begin. The end result? We won. LSU 41 – Ole Miss 35. We scored our final touchdown in the last minute of the game. No one was happier than me that we didn’t go into overtime. I think that’s called an encore in my world. Or something like that. Still, I managed to create my own theater at the end of the evening. Following the game, after noshing on a little fortunately-not-poisonous street sausage we bought from a peddler as we walked back to the car, we decided to check out a local Brazilian churrascaria while we were in town. My father is a big fan of meat. So it was the perfect choice. And the dinner was great. But the show was better. As we were all loosening our (figurative) belts and awaiting the bill, my mother challenged my daughter to a little dare. It’s a bit of a tradition on her side of the family and we thought it would be a good way to build my girl’s confidence. The bet? To take our nearly empty basket of cold bread to another (handpicked) table and offer it (waitress-style) to the diners. Upon hearing the rules, Viv’s face went beet red and she immediately declined until my mother said she’d pay her $25 upon completion of the task. 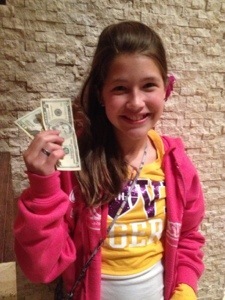 And, since my ten-year-old says she’s already saving for a CAR, she mustered up all her courage and accepted. Here’s how it went down. As you can see, she was one happy kid following the adventure. Her confidence was not necessarily there but her greed was firmly in place. We were all so proud of her. Except her brother. He was a little jealous. I think at that point he would have licked the men’s room floor for a dollar. Of course, we plan to up the stakes for next time. I can’t wait. EDITOR’S NOTE: I should point out that no one is ever willing to offer ME any money to do anything crazy. I guess I should take that as a sign. This entry was posted in Uncategorized and tagged bet, dare, do something on a dare, football versus theater, LSU, offering bread to a stranger's table, ole miss. Bookmark the permalink. Oh dear. That is priceless. Just…….priceless. I never heard of that before with the bread. Good for her. Way to be brave, ODNT Jr! My mother was the opposite. We would delight in embarrassing her with our antics in public. Good on your daughter for rising to the challenge! I have this feeling that she’s going to have a nicer car than me when she hits 16. What is the matter with those people? LOL!! This is hysterical!